It’s the most fruitful time of the year at V. Sattui Winery — harvest! For us, harvest is a very special thing. We work effortlessly to protect our land and vines year-round and it all pays off come September. On the 28th of August, Winemaker Brooks Painter, along with the winemaking team, blessed the first Sauvignon Blanc grapes picked in the 2018 harvest season. What else makes it so special? Here at V. Sattui visitors get to witness and experience the winemaking process first-hand from start to finish. No special reservations required! Early risers can see grapes being picked. On property guests can observe the freshly harvested fruit being loaded to the crush pad, then pressed into juice in our live-action bladder press and finally pumped over to the fermentation process. Come and learn how processing white grapes differs from how we process red grapes. Our production and hospitality staff is available for Q and A. Speaking of wine — here are a few new wines that we are looking forward to sharing with you! You can taste these wines in our tasting rooms or purchase these wines online. The 2016 Los Carneros Chardonnay. This elegant Chardonnay has ripe pear, fig and honeydew that glide gracefully through to the finish. The 2015 Anderson Valley Riesling is a distinctive and flavorful Riesling grown between the rolling hills of Anderson Valley. It is well-balanced with fresh flower impressions of jasmine and spiced pear. The 2016 Anderson Valley Pinot Noir consists of bold cherry and raspberry flavors that lead into a powerful and sensual palette. It will surely leave you wanting more. And, of course, it would not be fall without a Cab! The 2014 Napa Valley Cabernet Sauvignon has robust flavors of tobacco, toffee and truffle. This bottle is the best value 93-point Cab from Napa Valley and is guaranteed to leave a lasting impression. There’s no better way to celebrate the harvest season than the V. Sattui Crush Party on October 6! Experience the process of winemaking like never before, getting a behind-the-scenes experience with your closest friends and family. Be part of an old-fashioned grape stomp, taste wine straight from the barrels, meet our growers, learn about barrel making and blending wine all while enjoying live music and wood-fired pizza right off the Tuscan grill. We expect grapes of exceptional quality from the 2018 harvest and look forward to the newest vintage of V. Sattui wines. If you want to get a taste of these wines from previous vintages, be sure to book a tasting with us the next time you visit. Step into the shoes of one of our winemakers for the day and experience everything harvest has to offer at V. Sattui Winery. Cheers to a wonderful season! Similar to the variety of wine V. Sattui offers, we have an event for everyone! Whether you’re stopping by for art, music, dancing, or, of course, wine, join us all season long for fun and educational spring events for you and the whole family. The next event coming up is Jazz Under the Oaks – Live Music on Saturday, April 22. Not only is it Jazz Appreciation Month but nothing screams spring like a glass of wine and live music. So come enjoy the talented members of the Walnut Creek Civic Arts Jazz Band perform under the oaks. First, make a quick stop at V. Sattui’s Tasting Room and Artisan Deli & Marketplace for a bottle or two of winery-exclusive wines, sandwiches, salads, or charcuterie to pair with any of our 200 cheeses before heading to the picnic grounds. Our Cheesemonger is on hand to guide you, too. Grab the family, and come dance with us! No reservation required; dancing shoes optional. Can’t make it to Jazz Under the Oaks? The grounds are open every day at the winery, so be sure to come visit any day this spring! All aboard! On Saturday, May 19, join us for a unique Wine Train Meet the Maker experience where you will get to meet V. Sattui President, Tom Davies, and Director of Winemaking, Brooks Painter, for a wine and dinner pairing on the Napa Valley Wine Train. While coasting by the beautiful Napa vineyards, you will be able to taste some of our critically acclaimed wines paired with a four-course gourmet dinner made by Chef Donald Young. You will also have the opportunity to learn from V. Sattui President and Director of Winemaking face-to-face. Book your tour today on the brand new Napa Valley Wine Train Private Reserve Dinner Series for an experience you won’t forget! Hope to see you all at V. Sattui Winery this spring! Cheers! Wine of the Month Club — Our tasting room, delivered! At V. Sattui Winery, we craft one of the largest selections of award-winning, small-batch, small lot wines to suit a wide range of tastes. Our family motto— never be without great wine! From our cellar to yours, here are 10 reasons why you should sign up today. Established in 1976, V. Sattui is all about family and the generations that have made it what it is today: one of Napa Valley’s most iconic wineries. With a firm belief that wine is meant for sharing with your loved ones, Our Wine of the Month Club will keep you stocked up for all occasions. Celebrate all of life’s special moments with V.Sattui! Sattui wines are only available on location and online, but that doesn’t mean you can’t enjoy them in the comfort of your own home, anytime, all year long. Become a member of one of Napa Valley’s longest running Wine Clubs and get exclusive access and deals you can’t get anywhere else. Receive priority allocation of newly released wines and last of lots. Are you a red, white, or dessert wine fan? At V. Sattui, we aim to suit all your wine preferences. Our club is flexible, so feel free to customize your Wine of the Month Club order or simply upgrade to a club that best suits your palate. As a Wine of the Month Club member, you can choose to only receive white wines, red wines, dry wines, dessert wines, magnums, premier wines, or all of the above. Feeling adventurous? Switch between clubs as frequently as you’d like! Whites in the summer? Absolutely. Reds for the holidays? Of course! We bring the tasting room to you! Choose when you would like to have your wine shipped to you and how often. Wine of the Month Club members have the option of receiving 2, 4, or 6-bottle shipments each month, bi-monthly, or quarterly – or 3 bottles bi-monthly. If you’re going on vacation or out of town, just let us know and we will rearrange your shipping schedule. 5. Member-only events – it’s a family affair! Receive exclusive member-only invites to the year’s most anticipated parties in Napa Valley. At discounted prices, dance the night away at our annual Harvest Ball, experience an Italian mid-summer at our Festa Italiana, or be the first to taste the latest vintage straight from the barrel at one of our Barrel Release or Lobster Fest parties. The opportunities to celebrate with ‘family’ are endless. Wish to travel abroad with V. Sattui? We offer priority reservations to club members when booking our Wine Cruises and Tuscany Ground Tours. Need a vacation? Get discounted room rates at one of our partnering Napa Valley hotels, B&Bs, or inns. Kick back and relax with a glass of your favorite V. Sattui wine and enjoy the Valley’s scenery. If you are in town for the weekend, stop by for our signature BBQ or a private terrace tasting. 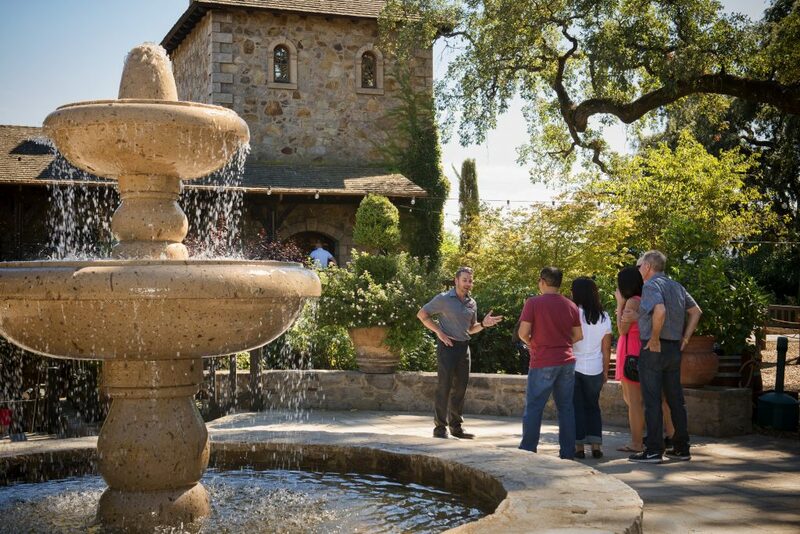 As a valued V. Sattui club member, we want to ensure you that every visit to the winery is special. Enjoy complimentary tastings, barrel tastings, and tours for up to four people every time. Reservations are required. Guests are encouraged! Do you have a favorite wine that you just can’t get enough of? Purchase a case or more and get a special discount up to 20% off! Don’t forget, as a member you can also receive discounts on pre-releases, previous months selections, and vintage wines. Planning a special event or dinner party and can’t decide which wines might pair best? Need a reminder when your favorite wines go on sale? Here to help is your own personal V. Sattui wine consultant available to offer professional tips and tricks and the very best offers to make that occasion a smashing success! As a V. Sattui Wine of the Month Club member, you are one step closer to becoming a Hall of Famer. An elite club level, this is granted to a few extraordinary members each year for their love, loyalty, and support. Are you the next Hall of Famer? Sign up for Wine of the Month Club today. Join the V. Sattui family today! Click here to become a Wine of the Month Club Member. Changing lives since 1974, Homeward Bound of Marin is a safe place. A mission turned reality, Homeward Bound is a local non-profit paving the way to solve and prevent homelessness. Dedicated to ending homelessness, these programs reflect the realization that a shelter alone would not solve the issue at hand. In addition to providing housing, Homeward Bound of Marin offers unique job-training programs, serving low-income students as well as residents. Fresh starts begin in the Culinary Academy— an award-winning program designed to prepare students for a job in the culinary industry. A 10-week intensive course immerses students in a hands-on environment where they learn not only kitchen skills along with life skills. In addition to food preparation, knife techniques, and recipe sizing, teamwork and conflict resolution are key. Fresh Starts graduate Lilyette Gallegos is a shining example that success is achievable. Unsure whether or not she would graduate high school, a career in culinary arts was only a dream. With a helping hand from Homeward Bound’s Fresh Starts Culinary Academy, hard work, and dedication, Lilyette was awarded for “Best All-Around Skills” and is now a high school graduate. Currently employed at the Sausalito Yacht Club, she is an advocate and role model for anyone interested in getting a fresh start. With over 60,000 nights of shelter provided last year, 343 beds offered in supportive housing, 72 students enrolled in culinary training, and $2.7 million saved through avoidable hospital stays, it is proven that Homeward Bound’s mix of “training, housing, and hope” goes a long way. Whether it’s through volunteering or donating, community members have been partners to make ending homelessness a reality for many. V.Sattui Winery, in partnership with Michelin-starred chef Stefano Masanti, is joining forces to support the shelter, housing, and training programs at Homeward Bound of Marin. Inspired by their strong Italian roots, V.Sattui and Chef Masanti have created a Midsummer pairing menu, featuring the traditional flavors of Italy. Wines: Optional V. Sattui wine pairing or V. Sattui wines by the glass for an additional cost. $60 per person – included a cooking demonstration, dinner. Proceeds support the shelter, housing and training programs at Homeward Bound of Marin. Celebrate summer Italian-style with V.Sattui Winery & Chef Stefano Masanti! Have you ever dreamt about vacationing in Italy? Imagine yourself in the village of Toscana or Lombardia– surrounded by lively music, laughter, aromas of mouth-watering food, all while sipping on a Rosato Di Sangiovese. Well, what if we told you we could bring Italy to you? Join us for the annual V.Sattui Festa Italiana, a mid-summer Italian festival. A unique summertime tradition in Italy, people line the streets to celebrate Summer Solstice. The word “solstice” derives from ancient Italian history meaning, “the sun stands still.” It’s an illusion that plays a significant role in long-standing legends and ceremonies within the Italian culture. Catholicism is at the heart of many Italian festivals; old traditions are mixed with modern day experiences, making mid-summer an exciting time of year for a visit. From jumping over bonfires in honor of rites of water and fire (might want to leave this one to the locals), to parades through city centers and street vendors filling the air with seasonal smells reminiscent of summer– it’s an event you don’t want to miss. What’s an Italian celebration without food and wine? June, July, and August are all about fresh, vibrant flavors, a reflection of the abundant sunlight during harvest. Carrying on the tradition, V. Sattui Festa Italiana isn’t complete without a pig roast, complemented by dishes bursting with fresh herbs, garlic, and an Italian-must, wine. A wine country event you can’t refuse– experience a night under the stars as we celebrate mid-summer, Italian-style. Don’t worry, you don’t have to be Italian, we celebrate family, friends, and you– our V. Sattui Community. Food & Wine: Enjoy a delicious meal courtesy of V. Sattui Winery and the Pig Man of Petaluma, paired with our award-winning wines. Live Entertainment: Dance the night away to music by Nino L’Italiano.